In the early 1990s, when Charlie Meeker was still practicing as an entertainment lawyer, he often traveled to France where he represented the bank Credit Lyonnais. On many a warm evening in summer, Charlie enjoyed a cold, crisp glass of French Rosé on his hotel balcony. These wines were fresh, fruity, acidic – and decidedly not sweet. He returned to the winery eager to replicate the many French Rosés he came to love, with a bit of a Californian twist. First, we call it Pink Elephant – irreverent at the core. But second, we make it in a decidedly nontraditional way. 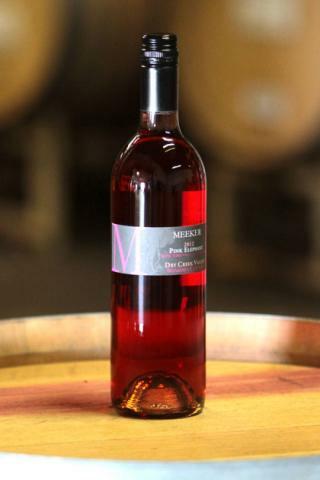 Historically, French Rosés are most typically made by crushing lighter red grapes like Grenache and Gamay and leaving them only briefly on the skins for gentle color and tannin extraction, and fermenting them dry – resulting in a ballerina pink color and fresh fruit characteristics. As is his normal practice, Charlie decided to turn this on its head. Our Pink Elephant is a blend, made from the free run juice of our red grape harvests, some fruity red juice and usually a dash of Chardonnay for complexity. As a result, our Pink Elephant is not sweet. It’s a layered, acidic, light-bodied wine intended for summer drinking on your deck, in your garden or at a picnic. We’ve been making Pink Elephant since the early 1990s, and for many years, it was tough to get folks in the tasting room to even taste Pink Elephant. They assumed it was like the fruit punch-tasting Blush they probably drank in college, with heavy sweetness and not a lot of wine characteristics. These Blush wines are easily conflated with Rosés, but they’re not the same thing. So here’s the moral of the story for those of you looking for something a little lighter to drink when it’s hot out in the summertime: Don’t be prejudiced against pink. Ask the right questions and you might end up with just the right wine for you.